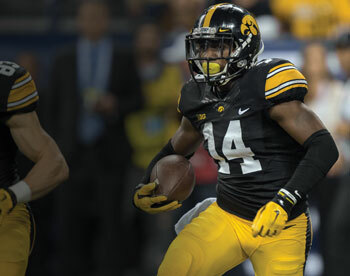 Despite setting a high school state record with 29 career interceptions at his Michigan high school, King didn't receive any early scholarship offers from a Big Ten program. Eventually committing to Ball State, King switched to Iowa a week before national signing day. Regarding his unconventional path, King says: "You have to stay patient and be humble. Keep praying and thank God for whatever you get and it will work out." Pressed into action as a true freshman in the 2013 season opener, King locked down a starting job at cornerback that fall. He continued his rise with three interceptions as a sophomore, eventually expanding his role as a return specialist in 2015 with 1,067 all-purpose yards. King's mother, Yvette Powell, raised four boys and made education their top priority. Though proud of King's accomplishments on the field, Powell has always emphasized the importance of academic success. "I believe in education first because anything can happen to you," Yvette says. "I want Desmond to have something else to fall back on besides football." King took his mother's message to heart, opting to forego the NFL draft and return for his senior season to complete his degree. To watch King's acceptance of the Jim Thorpe Award, visit http://tinyurl.com/gt8bxzj.